I live in the Wildwood subdivision and just wanted to say that the trails through the Forrest are still there, and not paved over. 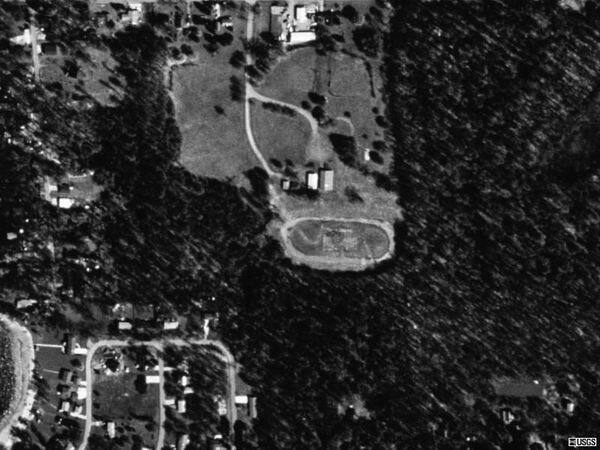 Also the track is still behind The Lions Club off of 95th Street where it has always been although it is in sad shape. Maybe someday someone will fix it up. Our family vacationed at Cable Lake from 1961 to 1973. The rear of our cottage was on the side of the lake that faced the race track and it was a short walk out the back door and through the forested area that ended up at the track. There was a foot path through the forest at that time. We used that short cut to walk up to the Driftwood which I'm glad to see, by recent pictures, hasn't really changed at all in 50 years. We would then walk through the track and down the entrance road to 95th Ave and then turn left for the Driftwood (about 2 more blocks). Anyway, at that time they were racing go-carts at the track and on those nights you could hear them over by us. At some point before 1973, that ended and the track fell into dis-repair and became overgrown with vegetation. Sometime in the late 80's or early 90's I returned to where our cottage was on Cable Lake and walked that path again only to find that most of the forest had been cleared, the track demolished, and there were now homes there and that foot path had been paved and was a street. I thought what a shame it was that Sisters Lakes became so commercialzed and lost it's old charm. Those still are some of my best and fondest memories of my life. My grandfather, Gordon Buss Miller, built and operated this track - as well as the nightclub across the street. This was also called The Rendezvous. 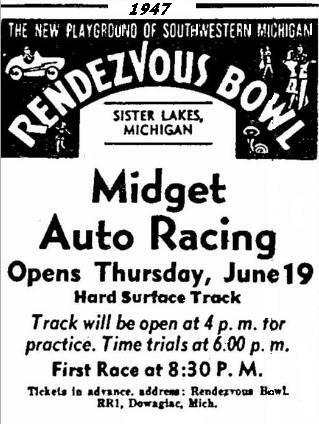 I don't know a lot of the history, though I was told by my parents that the top Indy Car drivers frequented this track and the midget racing circuit of the time. I am also told that my grandfather was a colorful man and that shenanigans similar to the prohibition era were common. The track was lost in 1949 in a Federal Court ruling that awarded the property to the lien-holder. If anyone has any more history about this please post. I grew up in Sister Lakes, MI. During the 60s the racetrack was used for racing go-karts.